Tell me that I’m not the only one who likes freshly baked bread and don’t tell me that I’m the only amateur bread baker. Everyone can make bread himself, given he has a perfect recipe. I tried making bread a couple of years ago and had no success. I’m wondering why my bread is crunchy only when it’s out from the oven. To be honest with you, I don’t like the guidance of bread baking books in that they rarely tell you how to adapt the water to your bread flour. It’s really worth learning how much water is needed because water can make your bread go to your dinner table or is directly thrown into trash. I’ve figured out that the age of flour decides how much water that flour needs. Thus, the experience here is that you shouldn’t follow the recipe exactly. Just remember that add around 3/4 water to the flour if you don’t know your bread flour is as old as the recipe’s flour, then adjust the remaining water slowly to the dough just until your dough is roughly incorporated but does not stick to the bowl. The required quality of the bread is that the bread has to be crunchy on the outside but fluffy like pillow on the inside. Sprinkle yeast in the water and let the yeast sits for 5 minutes. Then add in the flour and mix until you have a sticky dough. Cover and let the starter sit at room temperature for 10 hours. The maximum time for this process is 12 hours. After 12 hours, your yeast needs to be fed so that you have to work with the starter. – Mix sugar with 1 1/8 cups water and yeast. Let the mixture sit for 10 minutes until you see the bubbles on the surface of water. – Mix all the yeast mixture, starter, salt and bread flour in a bowl (you can safe time by using a stand mixer). Using a fork, stir well until flour absorbs all the liquid ingredients. – Knead by hand (or stand mixer) until a non-sticky dough is formed. During the kneading time, you can add more water slowly, 1 tbsp a time, to make sure the dough is not dry but no sticky to the bowl. – Add the oil to a clean bowl and keep the dough cover for the fermenting process. 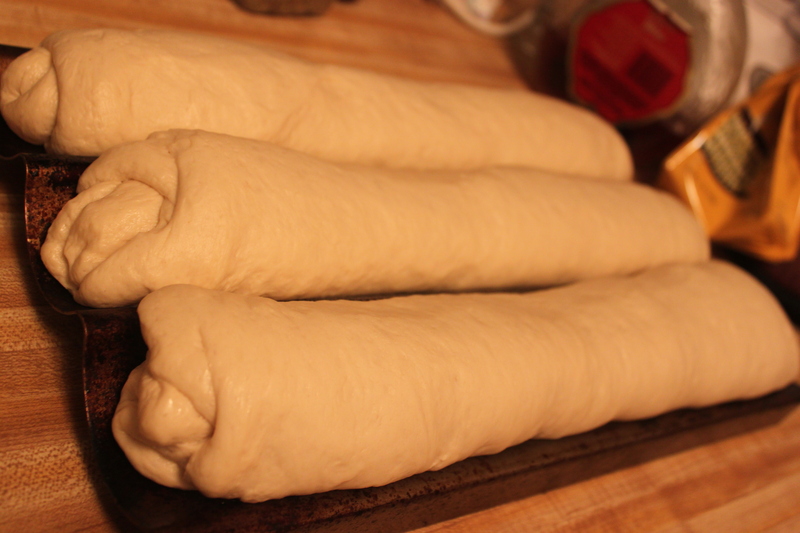 – Let the dough sit for 3 hours first, then deflate the dough, turn it over and let it sit for 2 hours. – Divide the dough into 3 equal portions. Fold and roll each dough into a log that fits your baking pan. – Let the dough sit for another 1 hour or until your dough is double in size. – Slash the puffed baguette with a very sharp knife. This technique can help the bread evaporate the steam from the inside, thus stimulating the puffing process in the high hot oven. 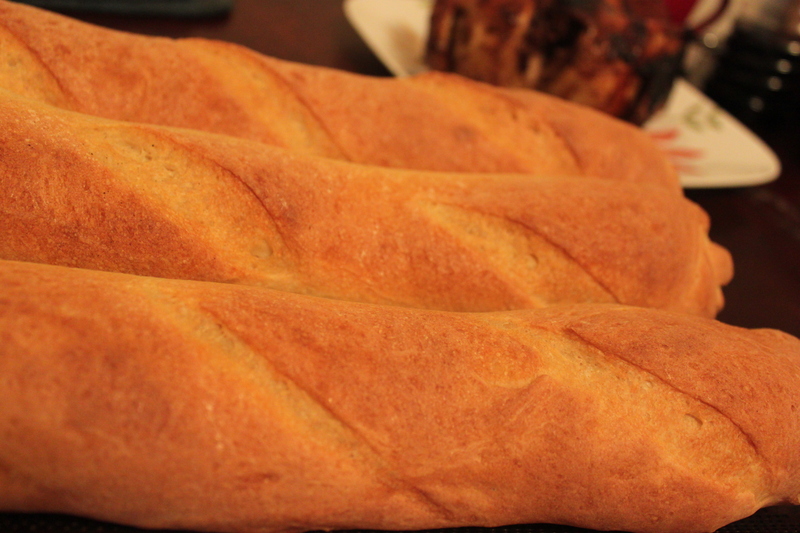 – Spray water onto the surface of the breads. 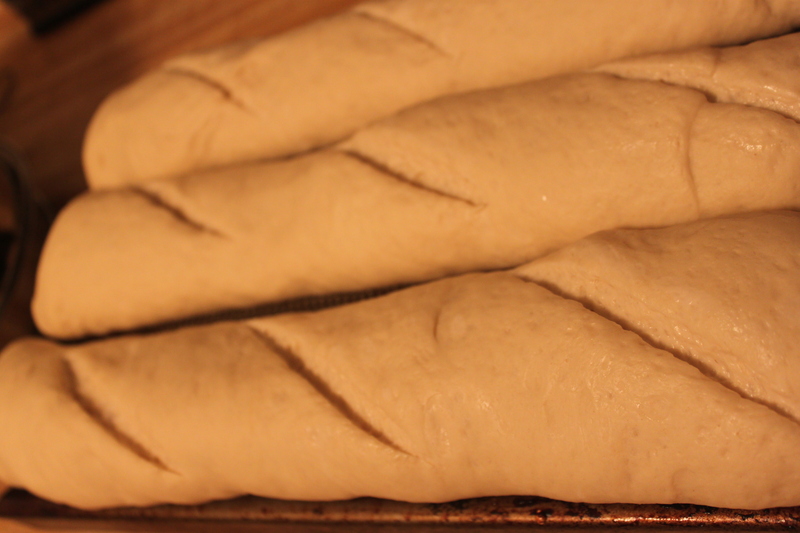 Bake at 10 – 15 minutes until the breads are golden. 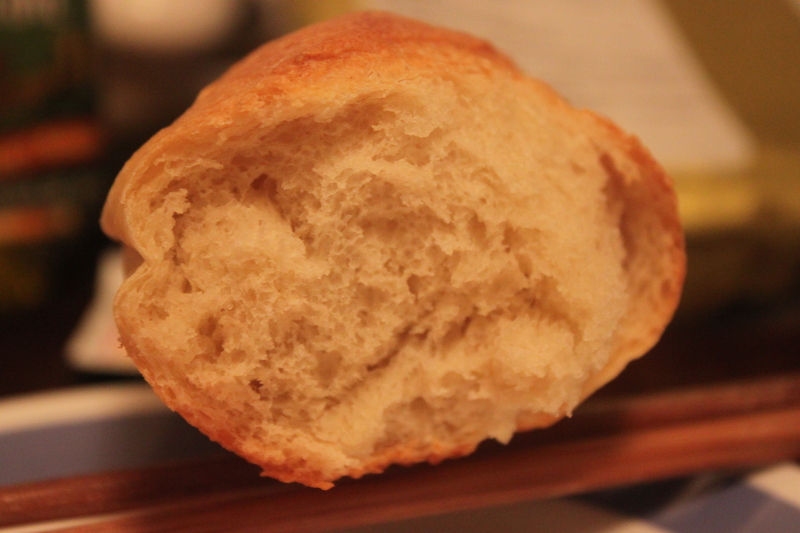 This entry was posted in bread, French, Vietnamese and tagged baguette, bánh mì bột chua, french bread. Bookmark the permalink.